Today, successful contact center managers understand the value of workforce planning and management – the scheduling efficiency gained here translates directly into cost savings. Monet Workforce Management software provides vital analysis to enable call center managers the ability to effectively manage their human resources and service level commitments. 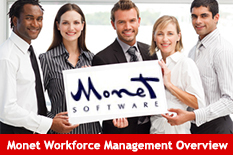 Monet WFM OnDemand is online workforce management technology that is managed by Monet Software. Monet WFM OnDemand offers the capabilities of Monet WFM 4.7 in an easy-to-use on demand model. Monet WFM OnDemand lets customers forecast and schedule agents to handle inbound calls, outbound calls, email, Internet messaging, web callbacks and other related back office activities. Monet WFM. Proactively communicate with agents and make scheduling changes in. Scheduling agent exceptions such as time off and one-time or recurring training meetings is a simple process with Monet’s fully integrated exception planner. Monet’s easy-to-use, color-coded availability calendar displays a real-time summary of time off, making it easy for managers to see whether to grant an agent’s time off request. Complete schedule integration.